Şaka değil, yoksa mümkün değil okunmaz. Diyorum ki bir yayın evi şu postumu okusa bu süper ve şahane ve çok ciddi kitabı Türkçe´ye çevirse mesela? Olmaz mı? Olur olur, cidden !!! This is a very serious book. Nothing silly is allowed. There are no funny faces, no clowns, and definitely no shenanigans. A serious book is always respectful, and, of course, is always in black and white. But wait! Who’s this? Zebra might be black and white, but he is NOT serious. And he and his friends are ruining the book with their antics, parades, and parties! 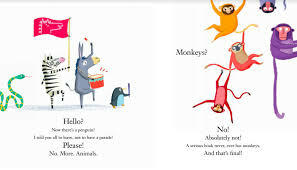 This funny and irreverent book that pits its narrator against its characters in a hilarious way invites reader participation and encourages kids to think about writing their own books and stories—just as donkey does here in the end. 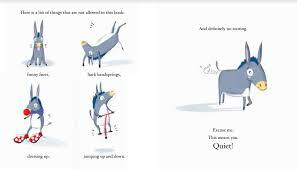 A joyful page-turner of a book that celebrates writing and creativity and will appeal to fans of The Book With No Pictures. Nefes su an 21 aylik olmasina ragmen kitabi okurken cok egleniyor. Merhaba, ingilizce kitapları nereden alıyorsunuz? Bu kitabı bulamadım.